As an Orthodox Christian I value Tradition, and as a biblical anthropologist I conceive of Tradition as a subject to be studied as objectively as possible. Such study is able to identify specific features and suggest an origin. This approach is likely to get me into trouble with my fellow Orthodox and so I ask them to forgive me if I offend. That is not my intention. In Orthodoxy, Tradition is said to live in the Church as the continuous expression of the Spirit's guidance and revelation and is the basis for the Church's authority. For an anthropologist, this definition seems theoretical and raises more questions than it answers. What exactly is the substance of the revelation? Is it fixed or does it change? Looking at Holy Tradition through the lens of anthropology one finds an unchanging tradition that was already well developed among Abraham's ancestors. This is evidence that God has had witnesses to His divine nature and eternal power in every generation since Eden. It also indicates that Holy Tradition is received, not invented, and that it has specific features that the followers of Jesus Christ would immediately recognize. These features include expectation of the appearing of the Son of God by a miraculous birth, His blood shed on a cross, His resurrection, and His oneness with the Father. For an anthropologist, the Bible is a useful resource for understanding Holy Tradition because only here do we find a consistent and cogent account of the people who lived in expectation of the Son of God and taught their children to do so. 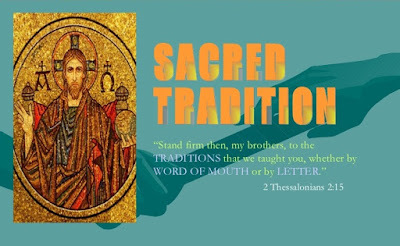 In other words, Holy Tradition is a family tradition. This is evident when one studies the genealogies and discovers that Abraham's ancestors and Abraham's descendants are a more homogeneous group than suggested by the different ethnic labels assigned to them. Abraham and David are key figures in this unique family tradition. Strangely, the Bible does not identify their mothers. This should stir curiosity since, among Abraham's people, one's ethnicity or bloodline was traced through the mothers. Were we able to identify these two women, we could point to the core family around which Holy Tradition is built. That has been a pet project of mine these past 30 years. The core of Christian Faith is found in kernel form in the Proto-Gospel of Abraham's Horite people. The origins of the faith of the Son or "Seed" of God came to Abraham, not as special revelation, but as a tradition received from his forefathers. The tradition is expressed in the first promise of Scripture: Genesis 3:15. Here we discover that the people who passed along the oldest material in Genesis believed that a woman of their ruler-priests lines would bring forth the Seed of the Creator and the Seed would crush the serpent's head. Article VII is one of the best of the Articles of Religion found in the Book of Common Prayer, especially this part: “Wherefore they are not to be heard, which feign that the old Fathers did look only for transitory promises.” Indeed. Related reading: Received Tradition: Pushing back the veil of time; Righteous Rulers and the Resurrection; The Horite Ancestry of Jesus Christ; Mary's Ruler-Priest Lineage; Is it Possible to Speak of the Proto-Gospel? ; Did Abraham Believe Isaac to be Messiah? ; Who Were the Horites? Hi, Sandra. That would make a terrific in-class activity.